This Antwerp classic’s intense mahogany colour with impressive and robust head stands out immediately. The aroma is complex with notes of biscuit, chestnut and unmistakeable caramel. The beer smells slightly smoked which is nicely balanced by a clear fruitiness, chiefly banana, and a herbal note of hop from the used noble hop varieties. All this comes back in the taste, which is pleasantly smooth, with a nuttiness on the tongue. 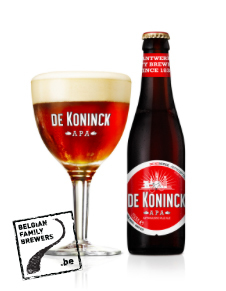 De Koninck is relatively bitter, but the bitterness does not stay and ends on a full, creamy aftertaste.